While Christmas has been celebrated for close to two thousand years, many of our modern Yuletide customs originated in Germany and Austria less than two centuries ago. From Advent calendars and Kris Kringle to evergreen trees and Silent Night, several Christmas traditions we hold dear in America actually have Germanic roots (although, the pickle ornament appears to be a myth). I am German on my father’s side and all of my Christmas memories are infused with the sounds, smells, and flavors of Germany. 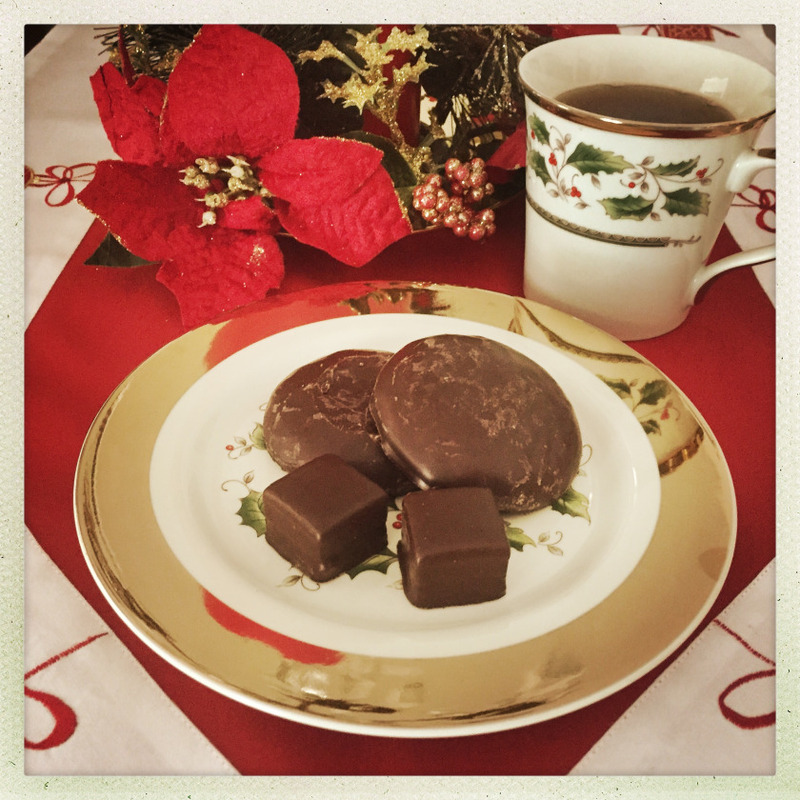 To this day, I place my order for lebkuchen (gingerbread cookies) and stollen (fruit cake) with German Deli in October and pick up a seasonal stash of marzipan (sweet almond paste) from World Market each November in preparation for the holidays. 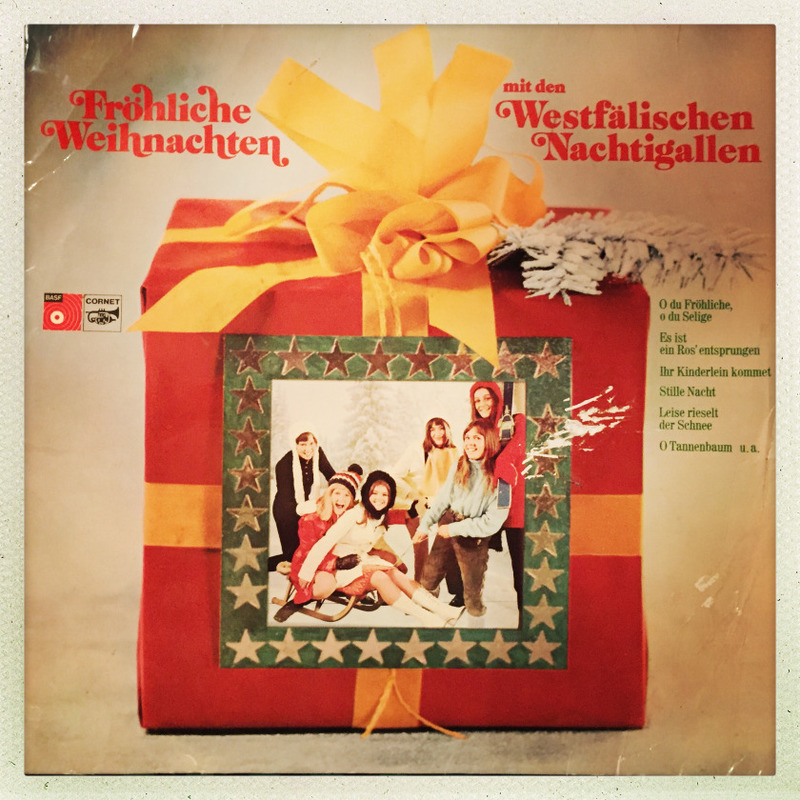 On cold December evenings, I enjoy mugs of hot glühwein (mulled wine), and I always listen to my favorite Christmas album, Fröhliche Weihnachten mit den Westfälischen Nachtigallen (Merry Christmas with the Westphalian Nightingales), while decorating the tree. 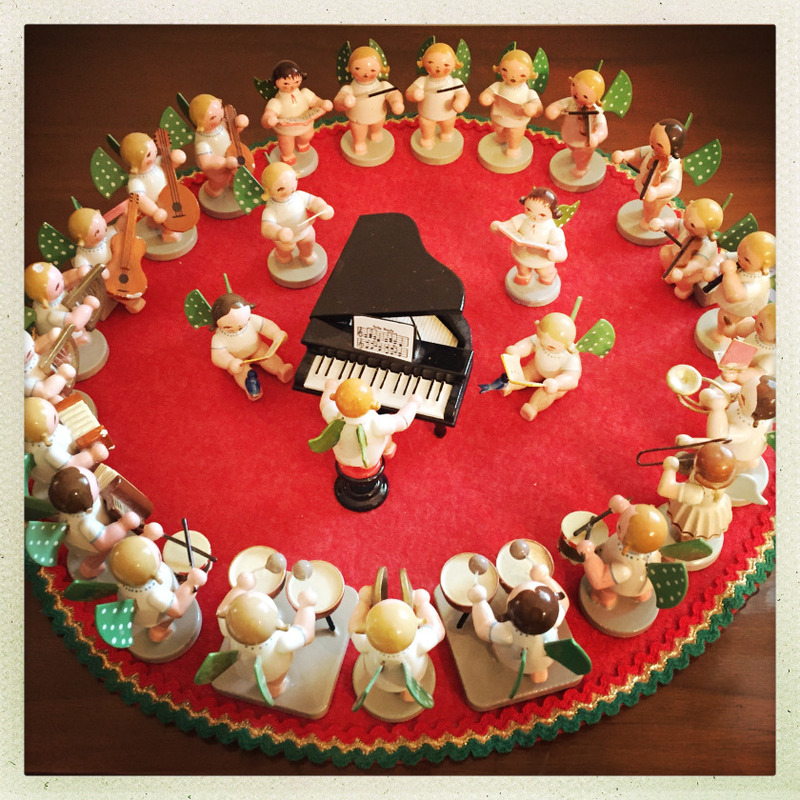 Since I was a child, I’ve had the task of arranging the celestial orchestra of hand-painted wooden Christmas angels that come from the Erzgebirge (Ore Mountains) in Germany. My family’s collection began with a gift of three angels—one each for my sisters and me—from our German nanny. 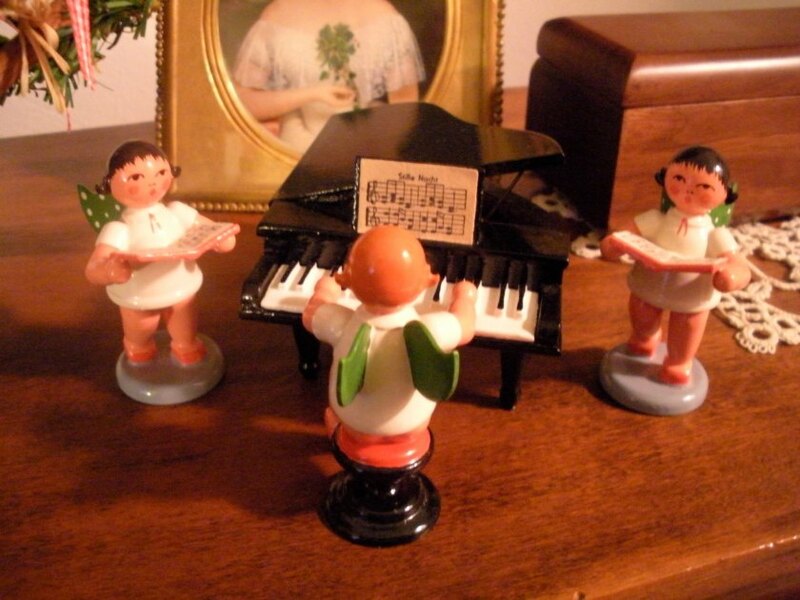 Every Christmas after she returned to Germany, she’d send us three small figurines from Wendt & Kühn in the mountain village of Grünhainichen to augment our display. In those early years, Erzgebirge angels could only be found in East Germany, so each diminutive gift was a rare treasure. Not realizing their value when I was young, I would often play with the cherubic figures, resulting in some chipped paint, a broken arm, and a missing wing among the heavenly host. Artisans from the Erzgebirge region also make wooden holiday pyramids, smokers, nutcrackers, and ornaments that are sold at many an outdoor Christkindlmarkt (Christmas market) in Germany from late November through December, but I have a particular fondness for the childlike cherubim. Today, Erzgebirge angels are available online and come in a wide variety of colors and styles, from bakers with gilded wings to long-skirted forms in natural finishes, but the tiny musicians from Grünhainichen with their polka-dotted green wings will always hold a special place in my heart. Whether or not you have German ancestry, consider giving a nod to the culture that redefined Christmas by starting your own collection of angels or other handcrafted wooden curios from the Erzgebirge. It may become a new holiday tradition that gives flight to a child’s imagination and one day inspires divine memories of Christmases past. 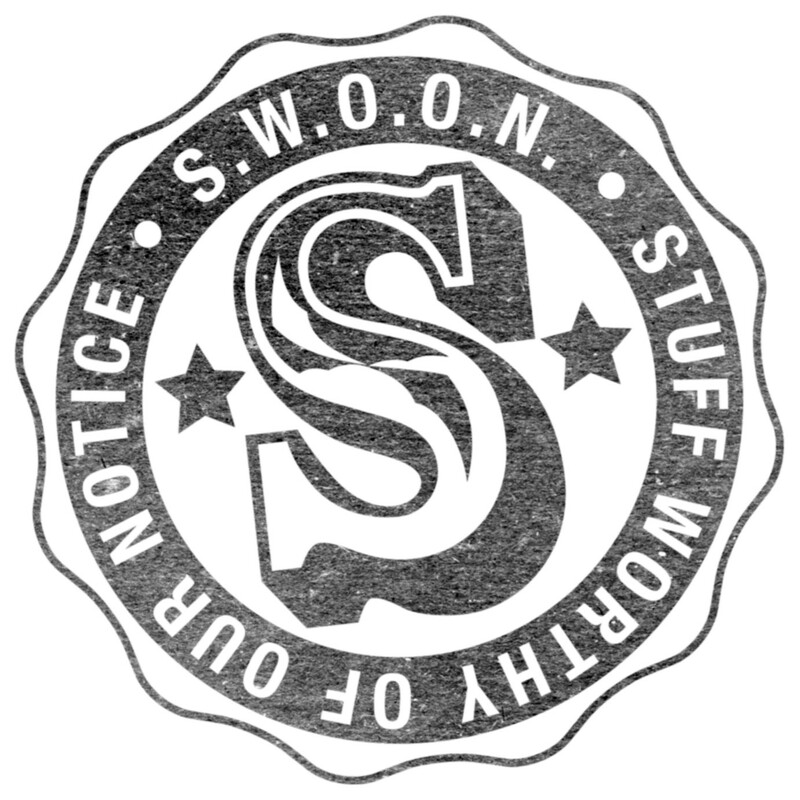 Grünhainichen angels can be purchased in the U.S. from Foster’s Imports and The Wooden Wagon. To browse a large selection of handcrafted items from the Ore Mountains of Germany, including a range of painted angel figurines, visit the Erzgebirge Palace.